Christmas isn't all about fancy presents and over-eating; it's about thinking about the people around you, and making the most of being at home. 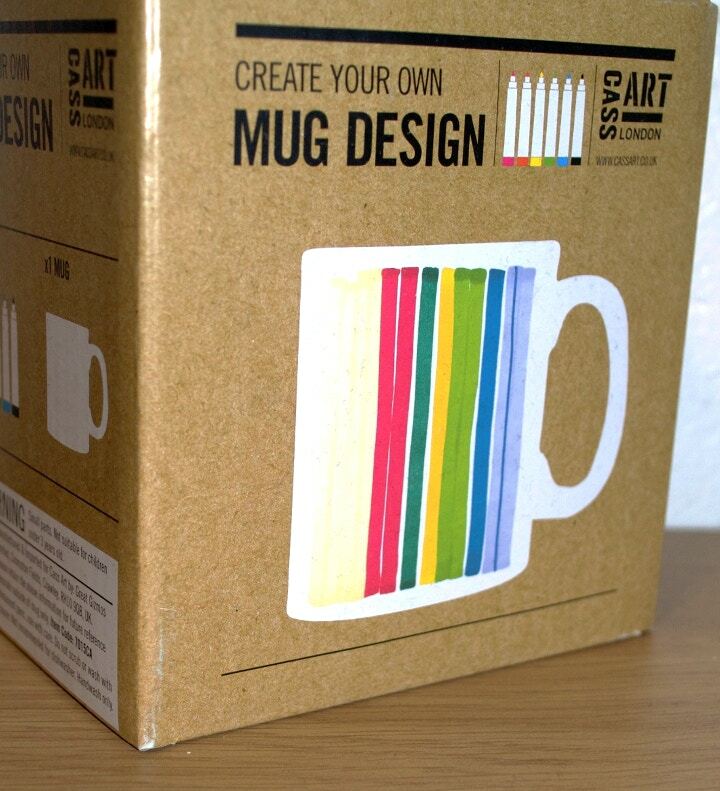 This year, we want to inspire you to MAKE CHRISTMAS, and student of Contemporary Art Practice, Megan Archibald, has a couple of great design ideas for the Cass Art Create Your Own Mug Design kit, which might inspire you to get creative and make a handy gift to give to your loved ones this year. I think that Christmas is a time to celebrate being at home, so I decided to create some mugs based on where I live, Aberdeen. We are a town known for oil, so I looked towards our local landmarks, and started to collect photographs of the rigs out on the horizon. With imagery in mind I began by sketching out some ideas on a scrap piece of paper, before transferring my design onto the mug itself. The markers become permanent after a few seconds, so I recommend keeping a damp cloth nearby to wipe away any mistakes as you go. I started by making a light line about one quarter of the way up the mug, to mark the horizon of my scene. 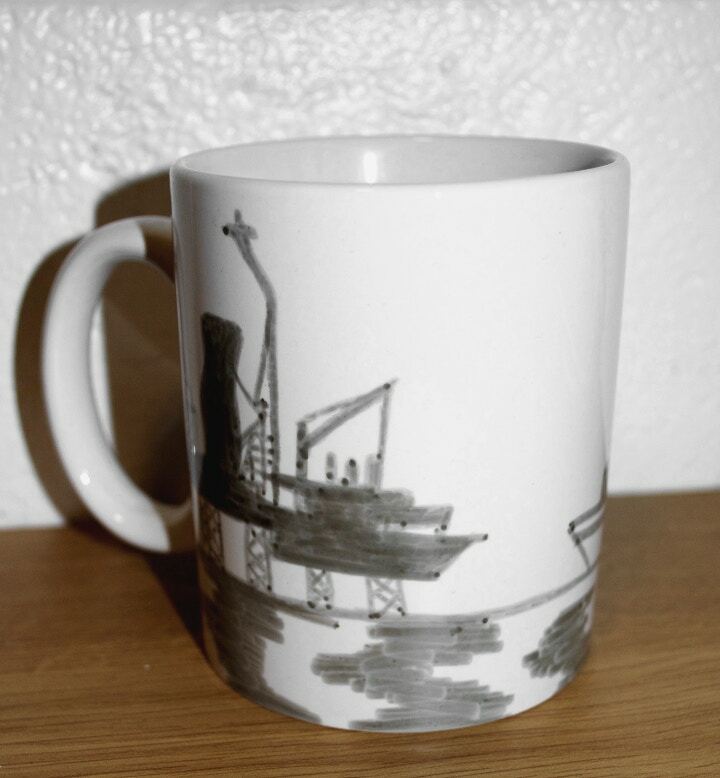 Using the black marker pen I then began to map in the basic basic silhouettes of the oil rigs, tankers and lighthouse. Because the nib of the markers are quite thick, I recommend opting for images based around block shapes and pattern, to make sure the final design is neat and clean. Once the darker shapes are mapped in, it's time to add colour and detail; the pigments within the markers are really strong, so there's no need to be shy here! I decided to recreate an evening scene at the harboursie, when the beauty of the landscape is highlighted by the colours of the setting sun. An unexpected bonus of the markers is that they are blendable, meaning you can layer different colours on top of one another, to create new shades or seamless gradients. In this case, I chose to blend black with the blue of the water, to echo the icy tides of the North Sea. The finished result is a tasteful nod to Aberdeen, and a beautiful Christmas gift for anyone who enjoys looking out to sea. For my second design I decided to try out something simpler; incorporating fewer colours and not rely on blending the markers. My favoured drawing style is quite childish and I love the opportunity to doodle, so I decided to go for a cartoonish look, which will appeal to all age groups. Gaining inspiration from bad Christmas card puns, I started playing around with a few ideas, which linked Christmas, humour, and Aberdeen. The chosen idea stemmed from a street in the city, which is closed to all vehicles except buses- this led me to think: if Santa visits, how will he get through? The bright colours and clean white background create an effective, happy and festive finish! Incorporating elements specific to your home town, or your friend's favourite place, gives the mug a personal touch, and will hopefully bring a smile to the recipients face on Christmas morning. Make sure to write the date on the underside of your mug, and sign your name so they will always remember who gave it to them and when. 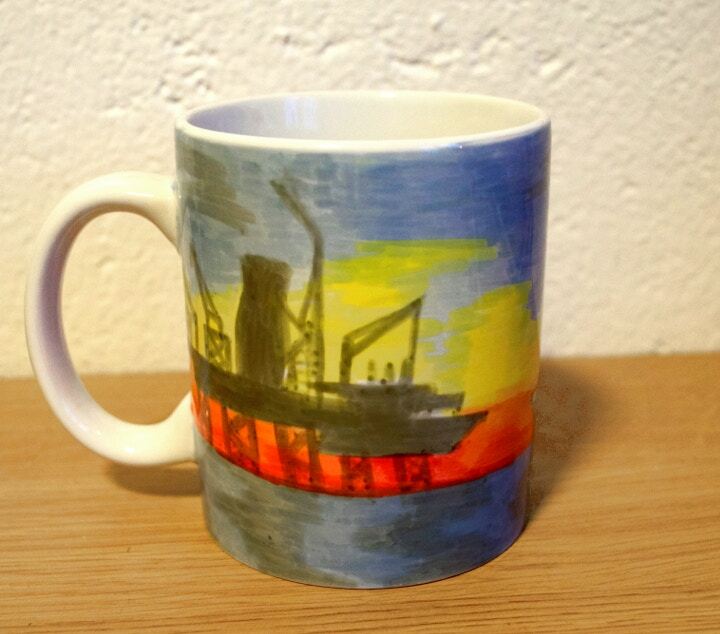 Shop for a Mug Design Kit online at Cass Art.